Annie welcomes Sara to today’s episode of This Naked Mind. 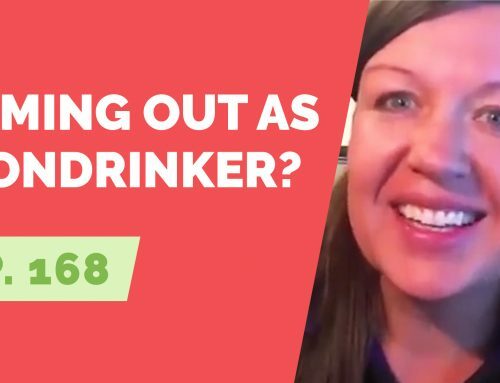 Sara delivers an honest, emotional interview about her path to sobriety and the reasons she gave up drinking. Annie and Sara discuss the ‘mommy wine culture’, the emotional pain of miscarriage, and the benefits of living a naked life. Both Sara and Annie give some creative, fun tips on how to offer alternatives when hosting a holiday gathering and how to handle an alcohol-free mom’s night out! My first sip of alcohol was such a pivotal part of the book for me. I happened to be 11, and it was a complete mistake. A complete and utter mistake. I didn’t intend to drink alcohol. I didn’t know it was alcohol. It happened at a family wedding. My sister happens to be older than me, she’s 10 years older than me, so she had had a cocktail I guess. It was really hot, and they give out these tiny, tiny little glasses at this wedding. I was so hot and so thirsty. Finishing my soda, I just took her glass from the table and immediately was just stunned and scared because I knew what alcohol was, but I never had it. I was very little, and I just remember feeling grossed out and sick, but also scared about having had alcohol illegally. My parents happened to be teetotalers. They drank back in like their early days on the cocktail circuit, but I never knew them as drinkers and they didn’t really approve of it, so my sister was doing her own thing. I remember feeling awful and woozy. Fast forward, though, when I went off to college, and I actually studied in Spain, alcohol just became part of my life. That’s when I would say that I acquired the taste, as you say in your book. I acquired the taste during college. Then becoming a mom, I really felt like I started to drink more, and I really settled on wine. This mommy wine culture that we have created in our country, I was a part of that, the mom’s night out or every occasion had to have wine with it. I was a part of that. I’d say by all measurements, I never had an outward drinking problem. I never had the bottoming out experience, but I knew that I was thinking about alcohol more than I wanted to be thinking about alcohol. This only increased after I had a miscarriage a year and a half ago. That grief really took me down. The alcohol just became part of my coping. The grief has quieted. It’s still there, obviously, because I get sad, but even though the grief has quieted, I was still drinking way more than I wanted to be. Like I said, not just drinking, but thinking about it. It was annoying. This craving, this thinking, it was bothering me. Usually I’d have two, maybe three glasses of wine, but there were two occasions where I had a whole bottle of wine by myself, and that was something I had never done before. The second time that that happened, I was like, “Okay, this book “This Naked Mind” that a lot of people have been talking to me about and that I actually already bought, and I’ve just resisted listening to, it’s time to listen.” Like you describe, I had the light bulb moment about two thirds of the way into your book. That’s it. It’s been three months, but it might as well be three years or 30 years because I just feel that cognitive-emotional break with this substance. It’s not a part of the life I want to lead, and it’s not a part of the life I want to raise my children in. I’m so thankful to you and to your book. Your methodology is so easy to adapt to your life. There’s no judgment. I think I had a lot of resistance in the beginning because I thought it would be a lecture, and it’s not at all. You’re so honest and real and non-judgemental, and I really appreciate that, so thank you. Have you been sucked into the mommy wine culture and want to get out? Start reading This Naked Mind for free today to find out how. I feel like first of all, just touching on the mommy wine culture, it’s one of the things that I find so sad because as moms, we need a tribe. We need the people around us. Throughout all of history, and in most other countries, we’ve been very close in motherhood, like the mothers have been close to the other mothers and the children all play together and there’s always been this sense of that. It’s so vital and so important. I don’t know when it was that alcohol got mixed up in that. It was probably started in the 50s and just kept going. I just want to say that like that stuff that we need is still so vital. I think that everything about the mommy culture, if you just take out the word wine, is so important. We’re making all these reasons to get together to pamper each other, to treat each other, to have some adult conversation, to have the kids play together so that we can actually … It’s all so important. I guess from your perspective, it would be great to hear, how do you maintain that while not partaking in the wine part of it? Tune in to the complete podcast to hear more on how Sara learned to make connections without taking part in the mommy wine culture.